Large areas of central Europe are experiencing their worst flooding in decades after heavy rainfall last week pushed rivers beyond their banks. At least 21 people have died across Germany, Austria, and the Czech Republic, and thousands have been forced to evacuate their inundated homes. Preliminary estimates suggest the flooding has caused several billion dollars in damage. In Passau, Germany – along the confluence of the Danube and Inn rivers – floodwaters rose to their highest levels in over 500 years. The city declared a state of emergency after swollen rivers cut off outside road access. Soldiers from the German army are being sent to flooded areas in southeastern Germany to provide disaster relief. 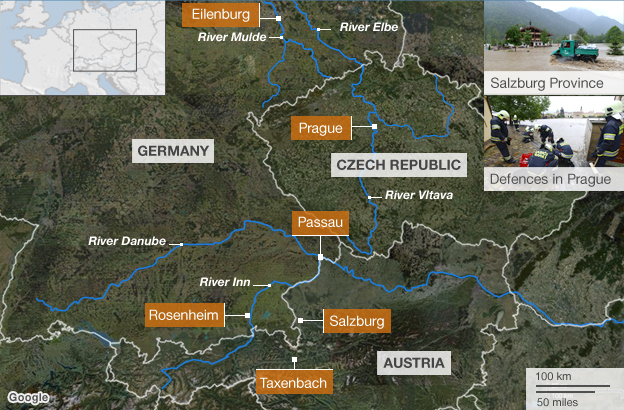 In the Czech Republic, the country is on high alert for its most severe flooding since at least 2002. Authorities closed the iconic Charles Bridge in Prague, where the Vltava River is flowing at 10 times its normal volume through the Czech capital, writes the BBC. Germany’s national weather service reports that southern and eastern Germany experienced near uninterrupted rainfall since Thursday of last week. Rainfall has been equally relentless in neighboring Austria, sending torrents of runoff through Alpine streams and rivers. Salzburg, one of the rainiest cities last month, received 259 mm (10.2”) of rain, according to Austria’s meteorological service (ZAMG). In a press release, the Austrian weather service says that May saw twice the normal monthly precipitation in most of the country’s nine provinces. Nationally, May 2013 ranked among the top 3 wettest Mays in 156 years of records (alongside 1962 and 1965). An expansive area of low pressure parked over eastern Europe is to blame for the excessive rainfall. Warm, moist Mediterranean air colliding with colder Atlantic air was lifted over the north side of the Alps. A stationary front then formed, bringing an extended period of unsettled weather. While this pattern setup is not unusual in the central Alps, the amount of precipitation measured in some locations was historically significant. Last week’s rains came at the end of an already cool and wet spring in Austria and most of western Europe. ZAMG notes that the March-May period ended up among Austria’s seven wettest springs on record. Several weeks of above-normal precipitation had already saturated the ground, which forced the additional rainfall to flow away as runoff. In Germany, the high water table and saturated soil may cause problems for agriculture this summer. In a national analysis of groundwater levels, the German weather service last week announced that ground moisture is at its highest in over 50 years, and in some places near record high levels (see image). Fortunately, rain-weary residents in central Europe can look forward to drier conditions in the coming days. Rain will start to taper off from west to east as Atlantic high pressure slowly pushes inland. Even so, many areas in central Europe still face a significant flood threat, as floodwaters only slowly start to recede.